Quite often, a major rail route will also have smaller branches associated with it. Where these are within a few kilometres of the main route, it is usually possible to keep them on the same grid. However, there will be other situations in which one major route branches off from another, and goes in a different direction. In these situations, we can create a divergent grid that shares the same coordinates and orientation at the junction, but then develops separately. In this way, continuous survey work can be carried out through the junction point and on in either direction. An example of this is the OBB12 grid, which originally defined the coordinate system from Oxford to Bicester to Bletchley and was created in 2012. This was subsequently seamlessly extended to Bedford with the creation of OBB12ext, and then in 2015 a new grid from Claydon Junction to Princes Risborough via Aylesbury (CAPR15) was created with common coordinates at the junction. [See the case study for more details]. Each of these grids has a separate parameter file. 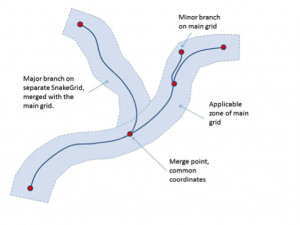 However, in order to transform data that straddles the different grids a combined “ASA” (alternative SnakeGrid algorithm) file was created that merges them all together.